In celebration of the release of A Problem of Ghosts, I'm offering a giveaway of some nifty bookplates for the ardent reader. (and be a member of Amazon.com, naturally). Yes, it's taken me this long to recover from Wizard World Portland Comic Con. It's a pretty epic con and I sold SO MANY BOOKS, and met SO MANY AWESOME PEOPLE! I love the conventions so much, I can't stop doing them. I'm really looking forward to the Rose City Comic Con coming up in September. I hope you'll drop by and visit! 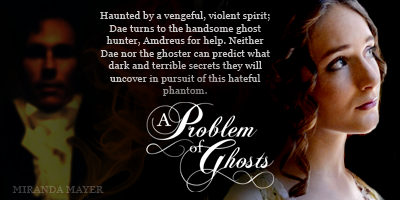 Problem of Ghosts is off to a lovely start. 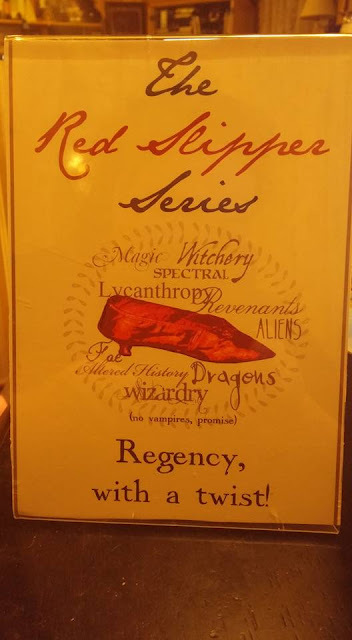 I'm really having a great deal of fun with the Red Slipper series (Regency, With a Twist!) --and I think I'l be doing more of these books. Regency with wizards; Regency with Ghosts, and coming up soon (I hope) Regency with Werewolves and Regency with Giants! There are so many fun places to go with this one. I also have some other genres on the cooker, and am slowly pecking my way through them. I've tried to refine my production process and stick to one project at a time. Being a Fly-By-The-Seat-Of-My-Pants kind of writer, with a healthy dose of attention deficit disorder, I tend to go Squirrel too often. But my mentor Shéa MacLeod is teaching me that focus is what works, and Problem of Ghosts is evidence of that. So apart from stopping to write down the new ideas that come along while on a project, I have been working exclusively on the book tentatively called Magpie. Will I go back to epic fantasy, and possibly Tinna's world? I don't know yet. Tinna's trilogy has sort of burned itself through me and left me breathless. So now I am focusing on lighter fiction. The time may come when I go back to check in on Tinna, her two husbands, Avria and the baby Istvan. In the meantime; I sold MANY of the trilogy at Comic Con this year. I even snagged a Lady Sif who was so reminiscent of Tinna in book 2, I had to have a photo op. 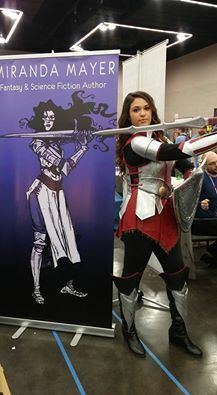 My table assistant cosplayed at Tinna from book one, but would you believe I didn't get a decent image of her? I'll bug her and see if she got one. She spent the convention like a little embassador, roaming wildly and spreading the word of Tinna and her world. I'm plugging along! I'll have a fabulous giveaway to offer soon, so stay tuned!